To know how the EU structures its relations with its closest neighbours. To discover the projects or areas of interest on which these types of associations are based. 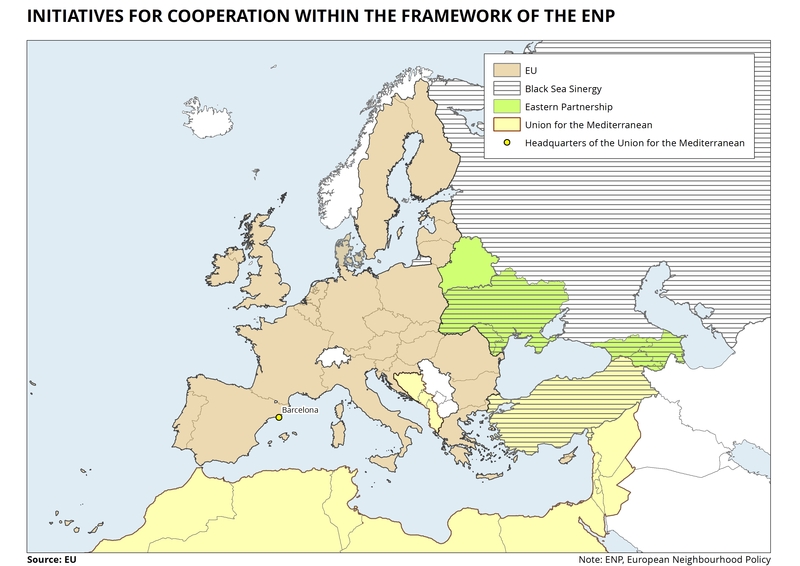 The European Neighbourhood Policy (ENP) originated within the context of the enlargement of 2004. The objective of this policy was to guide relations between the EU and its new neighbours. This policy is embodied in the signing of agreements which seek to establish privileged relations with the countries that share borders with the EU. These agreements cover such subjects as human rights, democracy, rule of law, good governance, transport networks, energy, principles of the market economy and sustainable development. The implementation of these agreements is financed through the European Neighbourhood and Partnership Instrument (ENPI). Later, in 2008, there were discussions about the possibility of extending this policy to the Southern Mediterranean through the launching of the Union for the Mediterranean. This initiative was the end result of what was popularly known as the Barcelona Declaration (which was promoted by the EU in 1995 and also by 12 countries in the southern Mediterranean area). The Eastern Partnership: Armenia, Azerbaijan, Belarus, Georgia, Moldova and the Ukraine. The Union for the Mediterranean: Albania, Algeria, Bosnia and Herzegovina, Croatia, Egypt, Israel, Jordan, Libya, Lebanon, Mauritania, Monaco, Montenegro, Morocco, The Palestinian Authority, Syria, Tunisia and Turkey. The Black Sea Synergy: Armenia, Azerbaijan, Georgia, Moldova, Russia, Turkey and the Ukraine. The EU offers technical support to help achieve the objectives established in these agreements for cooperation. However, even in some of the objective counties, the efforts of the EU to make advances with the ENP have suffered setbacks due to questions relating to human rights.